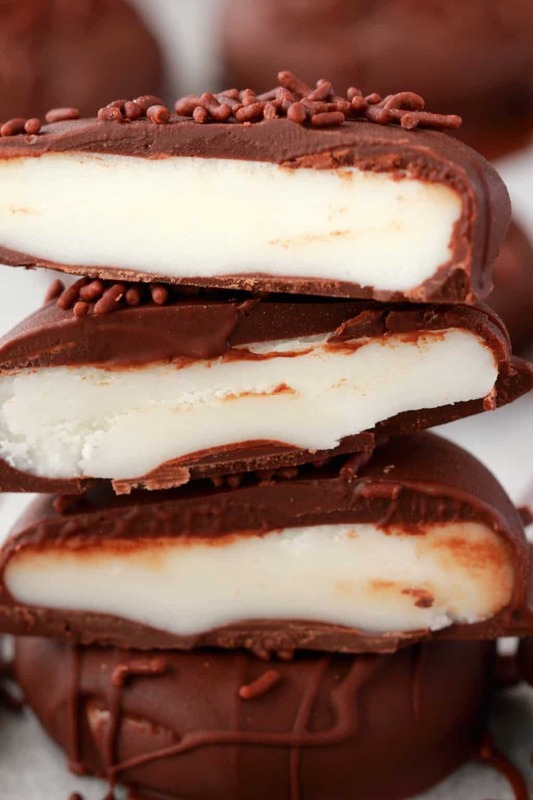 Ah vegan peppermint patties. Such a simple recipe really. Such a lovely concept. Yet….it took me an age to figure out! The trouble was I started off quite determined to make it work with coconut butter. And that turned out to be my downfall because I just could not. Now, I do love coconut butter, I really do. But the trouble was that coconut butter plus powdered sugar plus peppermint extract created a center that was just too hard. It was perfect in terms of color, but the texture wasn’t right. So then I tried it again but added in some golden syrup, now the texture was perfect, but the color wasn’t right! The golden color from the syrup made the centers too dark in color. So then I tried it using light corn syrup, but I wasn’t happy with the result. It was still a little too firm for my liking and I didn’t like the taste as much, the color was good, but it just wasn’t quite right for me. So then I was like: well why not make it with vegan condensed milk then? I mean, all the non-vegan versions make it with condensed milk. Why get stuck on the coconut butter as an ingredient? And that was when it all came together! 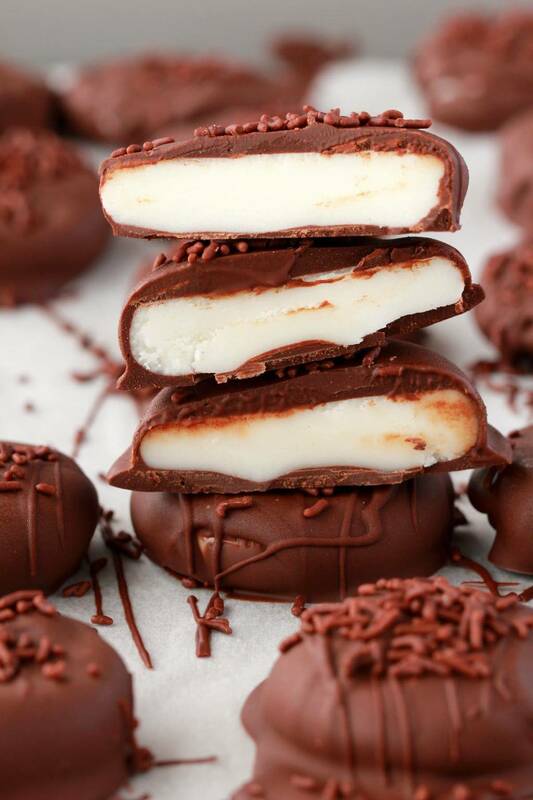 I made a batch of vegan condensed milk and mixed condensed milk with powdered sugar and peppermint extract and that created the most perfectly textured vegan peppermint patties in existence I am sure of it! 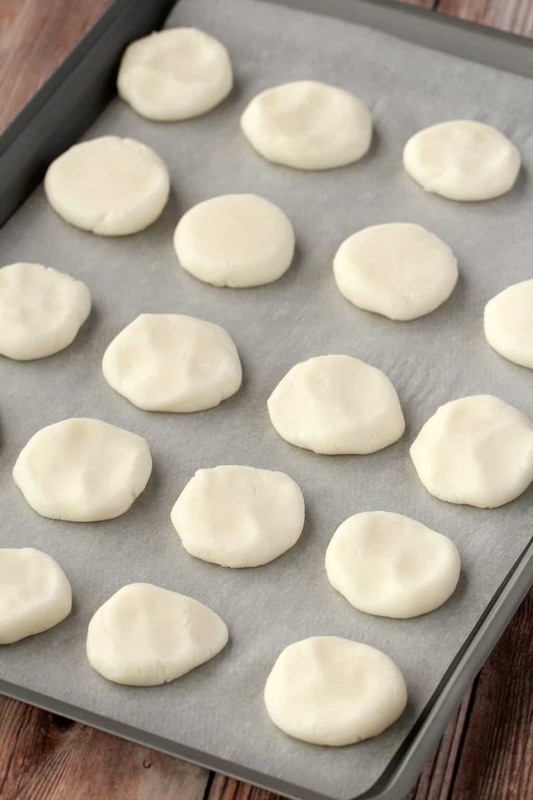 Using the condensed milk, it was just so easy, even creating the shapes for the patties was so easy, the dough was so pliable and easy to handle, it was just a pleasure. So the extra few minutes taken to make the vegan condensed milk is well worth it in my view. It really doesn’t take much longer to make our vegan condensed milk than it does to melt the coconut butter if you were using that! So it’s really much of a muchness. 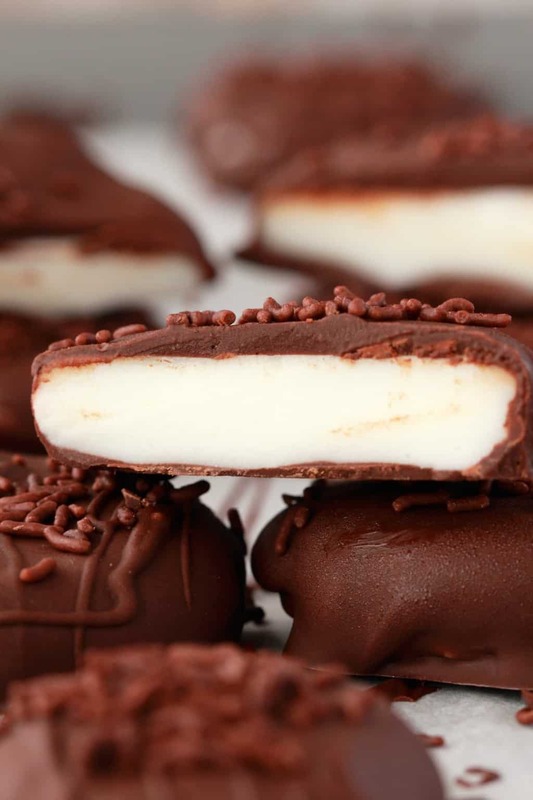 Having these vegan peppermint patties in the fridge to snack on is such a treat! The amount of peppermint extract to use is really a matter of taste. But I have found with experience that peppermint extracts can vary quite dramatically in strength. When I first started making peppermint desserts I had a brand of peppermint extract that was so strong, you could use a 1/4 tsp of this extract to flavor an entire batch of vegan mint ice cream! But I had no idea that it was anything out of the ordinary, I thought all extracts were equally as strong. And then I found out later that I would have to use up to 4 times more to get the same result when using different extracts. So, when it comes to peppermint extract, if you’re not sure how strong the one you have is, start off with a small amount, mix it in, taste it, and then you’ll know. You might have to use a lot more than stated in the recipe, or a lot less. Keep them stored in the fridge and enjoy them as and when you like! 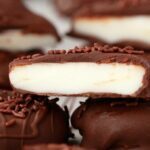 What do you think of these vegan peppermint patties? Let us know in the comments and by rating the recipe too please! Thanks so much! Sign up to our email list while you’re here! You’ll get an awesome (and free!) recipe ebook and you’ll stay updated with all our latest recipes posted to the blog! 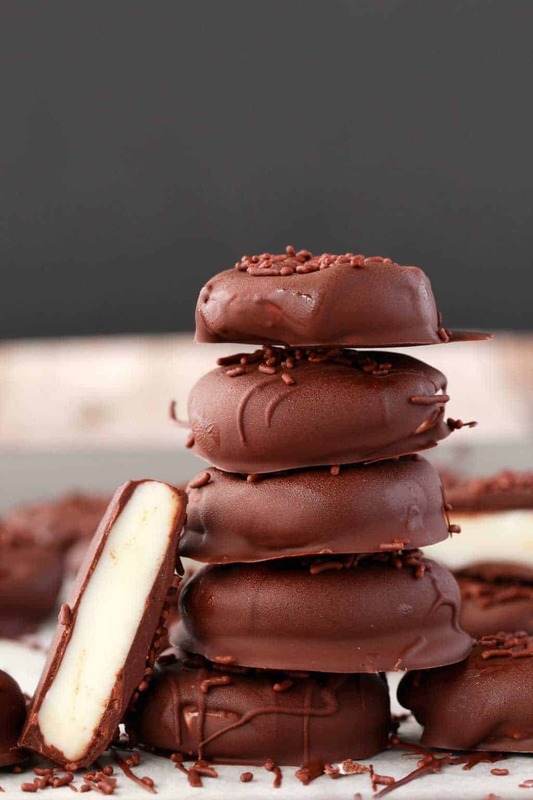 Perfectly textured melt-in-the-mouth vegan peppermint patties! 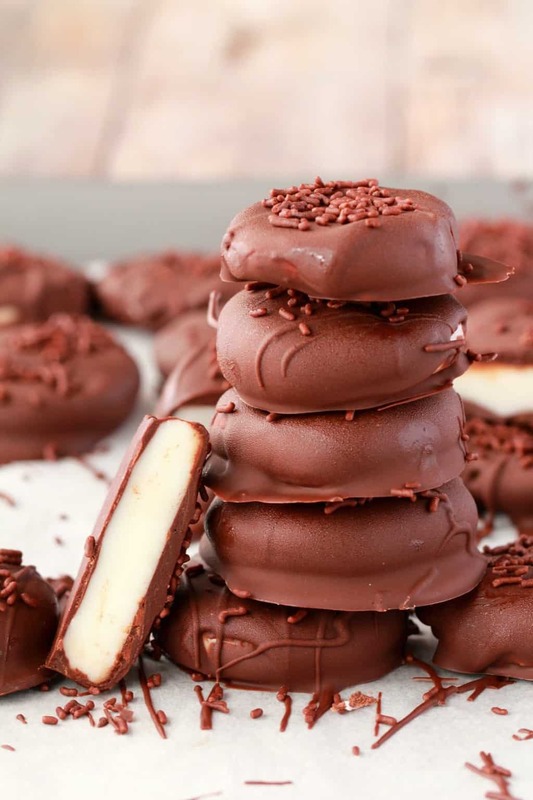 These creamy, dreamy peppermint desserts are so easy and fun to make and they’re so good you’ll want to have a permanent stash of these in your fridge! 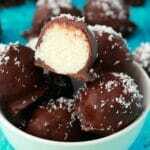 Add the condensed milk and 1 cup of powdered sugar to a mixing bowl and mix in. Gradually add the rest of the powdered sugar mixing in all the time until you have a big ball of dough. 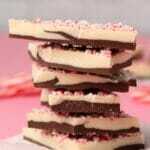 Add in the peppermint extract and taste test until you have the right amount. 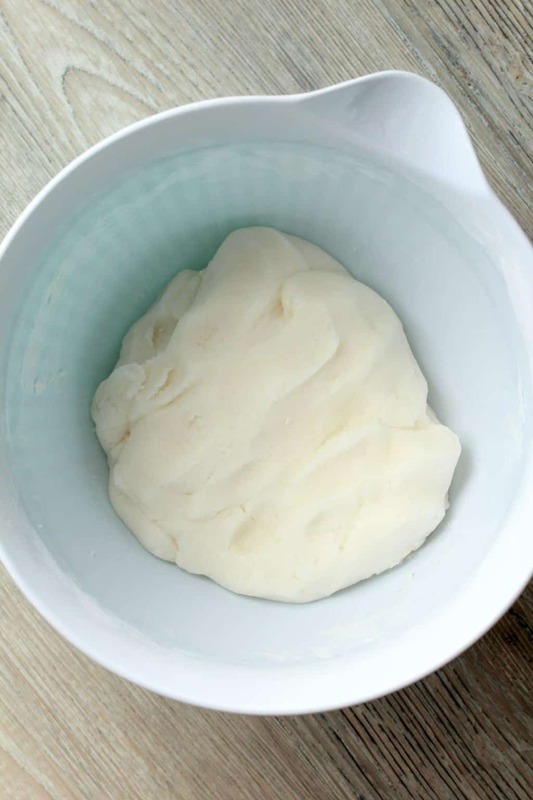 You can mix the dough with your hands a little to create a nice big ball of dough. It will be quite firm and not sticky. 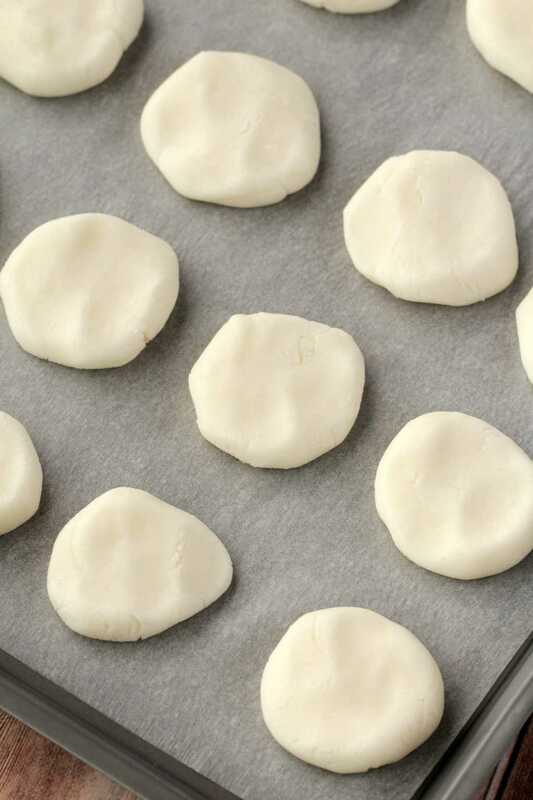 Cover a baking sheet in parchment paper and break off pieces of the dough and roll it into balls. Then flatten the balls with your hands into flattish rounds. Place into the freezer to harden. 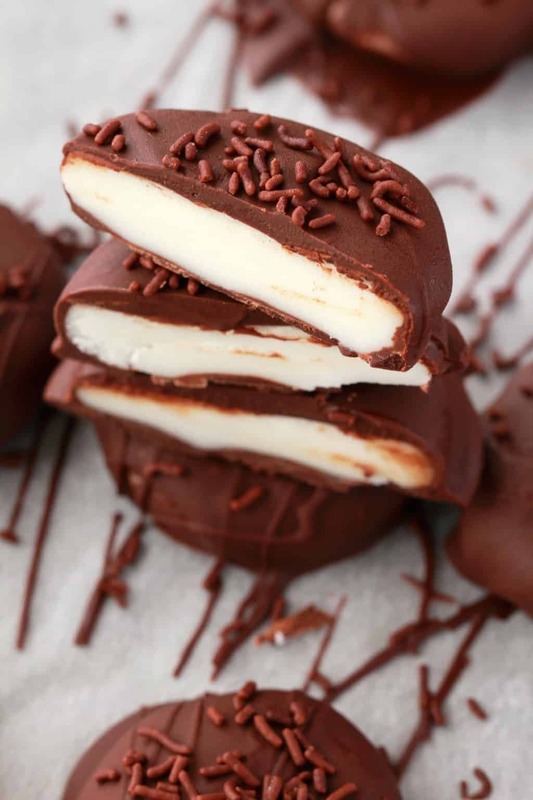 Place the chocolate (broken up into pieces) or chocolate chips into a microwave safe bowl and microwave in 30-second intervals bringing it out to stir every 30-seconds until the chocolate is melted. Add in the coconut oil to thin it out a little and stir in. 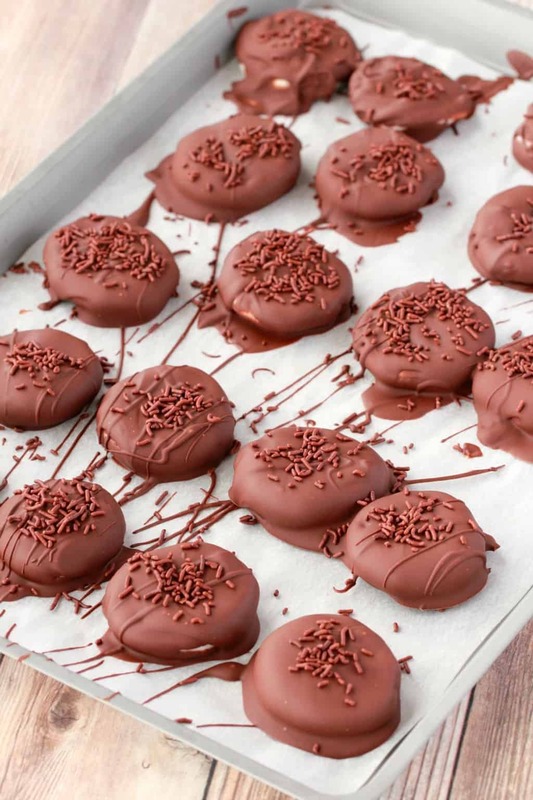 Dip the peppermint patties into the chocolate, using two teaspoons to lift them out and place them back onto the parchment lined baking tray. 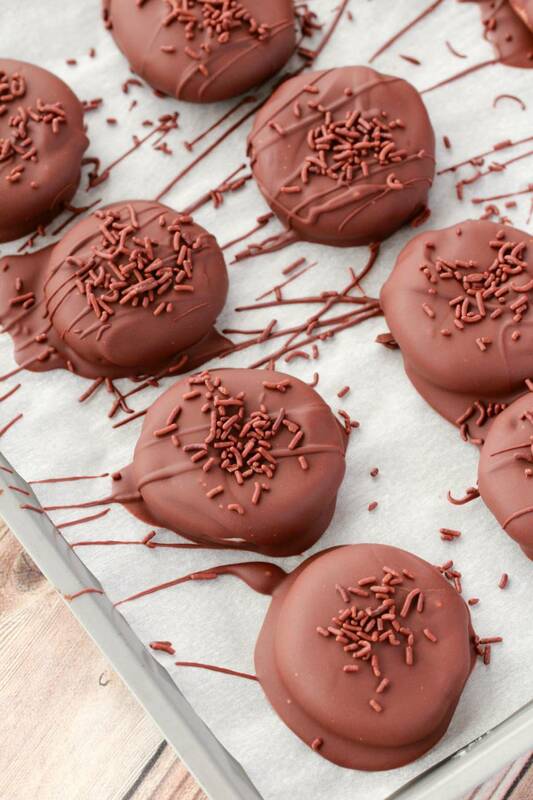 Sprinkle some chocolate jimmies on top if you like (optional) and place into the fridge to set. 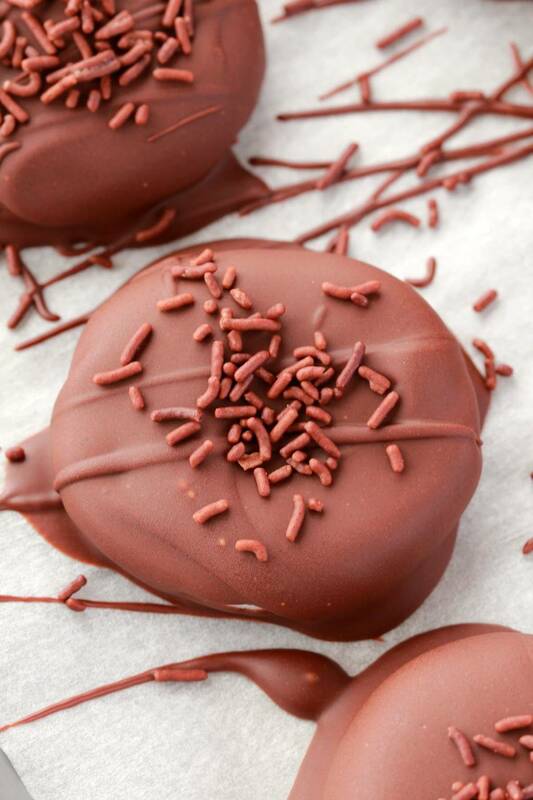 Keep stored in the fridge and serve directly from the fridge or the chocolate will melt. *The amount of peppermint extract you use will depend a lot on the brand of extract you’re using and how strong it is. Start slow and taste test to see how much to use. I have realized that there is a really big difference in strength between brands when it comes to peppermint extracts. *We have a full recipe and instructions for how to make vegan condensed milk in minutes in your blender but you can of course use a ready-made store-bought version of your choice! 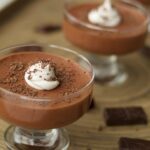 *Prep time for this recipe assumes the vegan condensed milk has already been prepared and doesn’t factor in the time taken to prepare that. They look scrumptious and taste even better!! These look wonderful! I can’t wait to try them! Thank you, thank you, thank you! 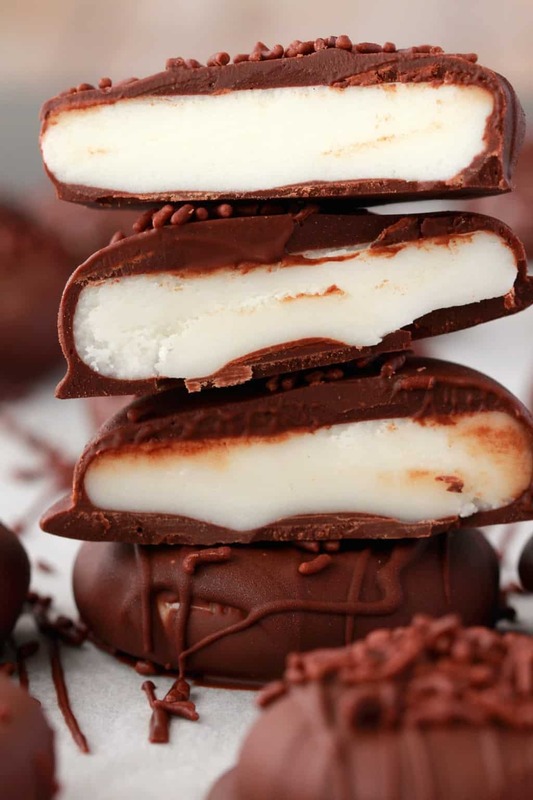 These easy-to-prepare treats are fantastic. My omnivore friends are astounded by these. My co-vegans are ecstatic. I have to admit to being skeptical the first time I made the recipe. I tried the condensed milk after I made it, and thought it was dreadful. I was worried that the finished candy would have that flavour of “I’m trying to be a food that people can eat as a substitute for foods they used to eat. Too bad I’m not a very good mimic, but hey, I’m better than nothing!” But I pressed on because the photos looked gorgeous. Then I added the powdered sugar and tasted again—after all, so many things are improved with powdered sugar! But again, I thought, “this tastes awful! These are not going to work.” I even prepared my significant other for disappointment. (He’s an omnivore but won’t eat York peppermint patties because of the unpleasant PGPR additive.) Anyway, with that warning to both of our expectations, I pressed on. Once I got enough peppermint oil in the dough, I was suddenly wowed. Then I finished the recipe and was stunned at how marvelous those little treats are. Eeeeeee! Thank you!! I’d like to offer the following slight differences I saw or made, in the event my comments might be helpful to someone. 2. Mixing Equipment: The second (of 2) times I made the recipe, I mixed the dough in my food-processor with the dough blade, instead of in the blender. 3. 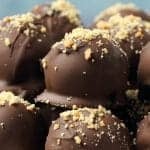 Chocolate: I used Enjoy Life semisweet chocolate chunks, and my patties didn’t need to be refrigerated after the first chilling right after I finished making them. I don’t know if that’s a result of the brand of chocolate, or the denseness of the soymilk dough, but I liked the serendipitous result. 4. Dipping equipment: For dipping the patties in chocolate, I used 2 long, narrow fondue forks. I stabbed the patty with one and then swirled the patty in the chocolate. I then pulled the patty out and gently twirled the patty to help some of the chocolate drip off. I used the second fork to help transfer the patty to my silicone baking mat, and then used one of the forks to move a bit of the chocolate from one part of the patty to the center to cover up the stab holes. It actually made a delicate little swirl on top! I’m so grateful to you for making it possible for my significant other and I to enjoy peppermint patties again.